The retinal blood vessels provide the opportunity to study early structural and functional changes in the microvasculature prior to clinically significant microvascular and macrovascular complications of diabetes. Advances in digital retinal photography and computerised assessment of the retinal vasculature have provided more objective and precise measurements of retinal vascular changes. Clinic- and population-based studies have reported that these quantitatively measured retinal vascular changes (e.g. retinal arteriolar narrowing and venular widening) are associated with preclinical structural changes in other microvascular systems (e.g. infarct in the cerebral microcirculation), as well as diabetes and diabetic complications, suggesting that they are markers of early microvascular dysfunction. In addition, there are new retinal imaging techniques to further assess alterations in retinal vascular function (e.g. flicker-induced vasodilatory response, blood flow and oxygen saturation) in diabetes and complications that result from the effects of chronic hyperglycaemia, inflammation and endothelial dysfunction. In this review, we summarise the latest findings on the relationships between quantitatively measured structural and functional retinal vascular changes with diabetes and diabetic complications. We also discuss clinical implications and future research to evaluate whether detection of retinal vascular changes has additional value beyond that achieved with methods currently used to stratify the risk of diabetes and its complications. The number of people with diabetes mellitus is projected to approach 600 million worldwide by 2035 . Microvascular and macrovascular complications are the major causes of morbidity and mortality in diabetic populations [2, 3, 4]. While intensive glucose control in patients with diabetes has been found to reduce the risk of microvascular complications, such as diabetic retinopathy , the beneficial effects of intensive glucose control on macrovascular and cardiovascular endpoints in type 2 diabetes are less clear [6, 7]. Thus, there remains a need to improve early detection of diabetes-related complications, preferably at the preclinical stage, to stratify patients at high and low risk of complications, and to better understand the underlying pathophysiology of these complications. The retina is both a site of diabetic damage and a ‘window’ to study early diabetic microvascular complications. Diabetic retinopathy, for example, is one of the earliest clinically observable complications of diabetes, and advanced stage diabetic retinopathy is a major cause of blindness in working adult persons . Also, retinal blood vessels, measuring 100–300 μm in size, can easily be assessed for the detection of early changes in the microvasculature. Advances in retinal photography and computer software technologies permit a more objective and precise measurement of retinal vascular changes, such as arteriolar and venular calibres, retinal fractal dimensions and vessel tortuosity . There are also techniques to detect and quantify retinal microaneurysms, and microaneurysm turnover (appearance and disappearance of these lesions over time), a measure of the dynamic process and disease activity in early diabetic retinopathy [10, 11]. Moreover, new retinal imaging techniques can now assess functional alterations in the retinal vasculature, providing a better understanding of the effects of chronic hyperglycaemia, inflammation and endothelial dysfunction on the microvasculature in diabetes. In this review, we summarise recent insights into the relationships of quantitatively measured structural and functional retinal vascular changes with diabetes and its complications. We also discuss future research directions and clinical implications. Hyperglycaemia defines diabetes mellitus and is the cause of microvascular and macrovascular complications . The earliest pathological responses to hyperglycaemia manifest in vascular cells, including endothelial cells, that are exposed to elevated blood glucose levels. In particular, the microvasculature, which has a specific role in regulating blood pressure and offering nutrient delivery, is sensitive to hyperglycaemia-induced damage. The microvasculature also exhibits vasomotion (spontaneous oscillation of small vessels observed in many microvascular beds), permeability and myogenic responses that can adapt flow to local metabolic needs [13, 14]. The most frequent structural histopathological feature is a thickening of the capillary basement membrane in the glomeruli, retina, skin and other organs. There is a linear relationship between glycosylated haemoglobin levels and the development of microvascular complications  such that the criteria (e.g. fasting blood sugar levels) used to define the presence of diabetes are largely derived from the occurrence of microvascular complications, especially retinopathy lesions at or above these levels. Hyperglycaemia-induced molecular changes are especially evident in capillary endothelial cells in the retina, mesangial cells in the renal glomerulus, and neurons and Schwann cells in peripheral nerves . Other specific cell types may also be involved in microvascular disease in certain tissue beds. In the retina, hyperglycaemia and associated responses such as inflammation, glycation and oxidative stress have been shown to induce the death of contractile cells known as pericytes [17, 18]. Similarly, in the kidney, podocyte injury and loss are a hallmark of diabetic nephropathy . Many mechanisms implicated in microvascular injury are common to endothelial cells, pericytes and podocytes. Endothelial cells in the retinal microvasculature that have been exposed to advanced glycation end-products show abnormal nitric oxide synthase expression and induction of vascular endothelial growth factor (VEGF) expression . Another mechanism that has been implicated in microvascular disease is oxidative stress. Hyperglycaemia promotes the formation of reactive oxygen species, which can cause damage by interacting with macromolecules such as DNA and proteins . In addition to these hyperglycaemia-related pathways, other mechanisms such as dyslipidaemia and inflammation enhance the development of microvascular disease . Although the precise contribution of each of these mechanisms to the development of microvascular complications in diabetes remain unclear, it has been firmly established that improved glycaemic control significantly reduces their occurrence. The retinal vasculature, consisting essentially of arterioles and venules (rather than arteries or veins), allows direct non-invasive visualisation of the body’s microvasculature. Changes in the retinal vasculature can broadly be divided into three groups: (1) classical retinopathy signs, such as diabetic retinopathy, (2) changes in retinal vascular calibre and (3) changes in global geometrical patterns of the retina . These retinal vascular changes in diabetes reflect underlying structural and/or functional alterations resulting from the effects of chronic hyperglycaemia, inflammation, endothelial dysfunction and other pathophysiological mechanisms [21, 22]. Classical retinal vascular signs are usually seen in patients with systemic diseases such as diabetes (referred to as diabetic retinopathy) or blood pressure (referred to as hypertensive retinopathy). Diabetic retinopathy, a common microvascular complication, is broadly divided into: (1) an early stage of non-proliferative retinopathy characterised by a spectrum of retinal vascular signs such as microaneurysms, haemorrhages, cotton wool spots and hard exudates; and (2) a later stage of proliferative disease, which is characterised by neovascularisation . Retinopathy signs are relatively late indicators of target organ damage in the eye and reflect advanced stages of structural microvascular damage, including breakdown of the blood–retinal barrier. Standard ophthalmoscopic examinations and fundus photography are currently used clinically to follow changes in the presence and severity of these retinal signs. Changes in the calibre of the retinal vessel, especially widening of the venules, has long been thought to indicate progression of diabetic retinopathy, with increased risk of developing functional abnormalities in the kidney and the eye. Over the last two decades, several computer software systems have been specially designed to measure retinal vascular calibre (or retinal vessel diameter) to document generalised retinal vessel narrowing or widening more objectively and reliably (Fig. 1). Retinal vascular calibre is measured in terms of central retinal artery equivalent (CRAE), central retinal vein equivalent (CRVE) and arteriovenous ratio (AVR) [23, 24]. CRAE is a summary index reflecting the average width of retinal arterioles, and CRVE is a summary index reflecting the average width of retinal venules. CRAE and CRVE reflect distinct systemic vascular physiology and disease pathways that tend to target the arterial and venous systems specifically. AVR is a dimensionless ratio of arteriole to venous calibre and has been used to control for magnification differences from camera lenses and refractive error. However, AVR is non-specific, and changes in AVR may reflect changes in arterioles or venules, or both. It should be noted that computer-assisted measurement of retinal vascular calibre from retinal photographs only measures the width of the reflective erythrocyte column and underestimates the true internal vessel calibre, as it does not measure the surrounding clear plasma zone. Figure 2 shows examples of narrowed retinal arterioles and widened retinal venules. The human circulatory system is a branching system that conforms to optimum design principals (i.e. Murray’s principle) . The optimal retinal vascular architecture will deliver the most efficient blood flow, and deviations or alterations from optimal retinal vascular architecture are thought to result in impaired microcirculatory transport, increased shear stress, reduced efficiency and, hence, a greater risk of vascular damage. Diabetes is known to be associated with increased shear stress and microvacular endothelial dysfunction . In addition to retinopathy signs and retinal vascular calibre, a range of new retinal vascular measures are being explored to quantify the geometric branching network (e.g. fractal dimension, tortuosity, branching, length:diameter ratio, optimality ratio, deviation of junction exponent) of the retinal vasculature in different systemic diseases. These newer retinal vascular measures may reflect the ‘optimal state’ of blood distribution in the microvasculature. Several systems have been developed to measure these geometric patterns [27, 28, 29, 30, 31]. Figure 3 shows the Singapore I Vessel Assessment software (SIVA, National University of Singapore, Singapore) quantitatively measuring retinal vascular structure from a retinal fundus photograph [31, 32]. Markers of progression of diabetic retinopathy include not only the presence of microaneurysm, the earliest clinically recognisable feature of diabetic retinopathy, but also rates of microaneurysm formation and disappearance (turnover) and microaneurysm count change over time [33, 34]. Microaneurysms appear and disappear in the retina of diabetic patients over time, disappearing by closing down due to thrombosis, while new ones appear in different locations of the vascular tree . The RetmarkerDR software (Critical Health SA, Coimbra, Portugal) was recently developed to analyse microaneurysm turnover (microaneurysm formation and disappearance per time interval) in colour fundus photographs . Recent studies showed that a high turnover, based on the results of computer-assisted detection, is a predictor for the development of diabetic macular oedema (DMO) in eyes with non-proliferative diabetic retinopathy [10, 11, 35] and for anti-VEGF treatment response in eyes with macular oedema . These studies suggest that microaneurysm turnover can identify diabetic patients at higher risk for worsening of retinopathy and may be an indicator of vascular disease activity. A number of epidemiological studies have shown that retinal vascular changes, particularly changes in retinal vascular calibre, reflect early microvascular processes in diabetes and in people at risk of diabetes. Table 1 summarises the associations between quantitative retinal vascular measures with diabetes in population-based prospective and cross-sectional studies. As microvascular alterations may result in a reduced ability of insulin to mediate glucose uptake in skeletal muscles, microvascular disease has been hypothesised to contribute to the development of diabetes [26, 37]. Retinal arteriolar narrowing has been reported to be associated with increased risk of diabetes in middle-aged people without diabetes in the Atherosclerosis Risk in Communities study . This observation was subsequently replicated in the Beaver Dam Eye Study, which had a longer follow-up period of more than 10 years , and in the Australian Diabetes, Obesity and Lifestyle study, which used a more precise definition for diagnosing diabetes (OGTT) . The prospective data provided by these studies indicate that narrowed retinal arterioles precede the development of diabetes and thus suggest that arteriolar changes may play a role in the early phases of disease development. In contrast, data from the Rotterdam Study indicated that retinal venular widening, rather than arteriolar narrowing, was associated with incident diabetes and impaired fasting glucose . Thus, it is still unclear whether retinal vascular changes in non-diabetic individuals are markers of future diabetes risk. In population-based cross-sectional studies, retinal arteriolar widening, rather than arteriolar narrowing, was associated with prevalent diabetes, impaired glucose tolerance and impaired fasting glucose [40, 41, 43, 44, 45]. It is postulated that in the diabetic retina, hyperglycaemia and hypoxia result in retinal vasodilation, leading to hyperperfusion (early vascular change). Nevertheless, there may be racial/ethnic variations in the association between retinal vascular calibre and diabetes. For example, in the Multi-Ethnic Study of Atherosclerosis, the cross-sectional association between retinal arteriolar widening and diabetes was seen mainly in white individuals, whereas the cross-sectional association between retinal venular widening and diabetes was only observed in non-white individuals (Hispanic and Chinese) . The Singapore Malay Eye Study (SiMES) further explored the associations between a series of other retinal vascular network measures (tortuosity, branching angle and fractal dimension) with prevalent diabetes . People with diabetes had straighter (less tortuous) arterioles than people without diabetes, whereas venular tortuosity, arteriolar and venular branching angle and fractal dimension were not significantly different between two groups. This finding of straighter arterioles amongst diabetic individuals, however, is in contrast with the findings of a clinic-based study, which found that people with diabetes had more tortuous retinal arterioles and venules than people without diabetes . Clearly, prospective data are needed. Key diabetes-related factors, such as longer duration of diabetes and higher HbA1c levels have been cross-sectionally associated with retinal vascular network changes (e.g. larger arteriolar branching angle and increased arteriolar tortuosity) in young type 1 diabetic individuals, even in those without evidence of retinopathy, suggesting that changes in the retinal vascular networks may be early markers of diabetes-related microvascular injury . Hypertension and ageing have profound effects on the retinal vasculature, particularly on retinal arteriolar narrowing, increased wall:lumen ratio and rarefaction of retinal vasculature, in non-diabetic individuals [9, 49]. These factors should be taken into account when studying the independent associations between retinal vascular changes and diabetes. In terms of diabetic microvascular complications, studies have primarily focused on the association between retinal vascular calibre and the risk of diabetic retinopathy. For type 1 diabetes, studies have in general suggested that retinal vascular calibre may be associated with the risk of diabetic retinopathy-related outcomes, though the data are not entirely consistent. In the Wisconsin Epidemiologic Study of Diabetic Retinopathy (WESDR), both wider retinal arteriolar and venular calibres measured at baseline were associated with an increased risk of progression of diabetic retinopathy, but were not associated with the 4 year incidence of diabetic retinopathy . In another study, among 468 African-Americans, neither arteriolar nor venular calibres were related to incident diabetic retinopathy . In contrast, wider arteriolar calibre, but not venular calibre, at baseline was associated with an increased risk of diabetic retinopathy in a study that included 645 Australian children and adolescents with type 1 diabetes . Recently, wider venular calibre, narrower arteriolar calibre and lower fractal dimension measured at baseline were shown to be associated with the 16 year incidence of proliferative diabetic retinopathy in a population-based young Danish cohort with type 1 diabetes [52, 53]. 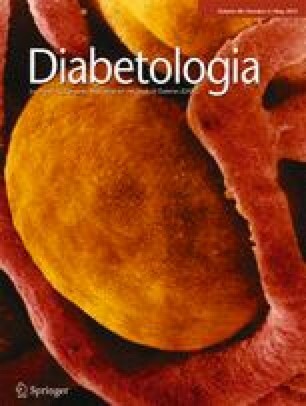 For type 2 diabetes, neither arteriolar nor venular calibres has been found to be associated with the incidence or progression of diabetic retinopathy [54, 55]. This discrepancy between the findings in patients with type 1 and 2 diabetes may be due to differences across these studies in the distribution of age, confounding effect of other cardiovascular risk factors such as presence of hypertension (∼20% among patients with type 1 diabetes vs ∼70% in type 2 diabetes), sample sizes and follow-up periods . Two studies have examined whether longitudinal changes in calibres are related to the risk of diabetic retinopathy. In both type 1 and 2 diabetes, widening of the venules was independently associated with a subsequent increased incidence of diabetic retinopathy and increased risk of diabetic retinopathy progression [55, 57]. Thus, retinal venular dilation appears to be involved in pathological processes associated with diabetic retinopathy, possibly through mechanisms such as impaired vascular autoregulation and hyperperfusion, tissue hypoxia and ischaemia, and aggravating risk factors such as hypertension. In addition to vascular abnormalities, the neurosensory retina may be primarily affected in diabetes. Whether diabetic retinopathy is primarily a neurogenic or vascular disease is subject to debate. It has been suggested that the retinal dysfunction associated with diabetes may be viewed as a change in the retinal neurovascular unit, providing new insights into the pathophysiology related to both vascular dysfunction and neural degeneration, and this may be essential for identifying new therapeutic targets [58, 59]. Several studies have examined the associations between retinal vascular calibres and diabetic nephropathy. In a clinical trial of type 1 diabetic individuals both baseline and subsequent changes over time in retinal vascular calibres were independently related to changes in renal structural variables, such as glomerular basement membrane width, mesangial matrix fractional volume and glomerulopathy index, as measured on sequential biopsies . In participants with type 2 diabetes in the WESDR study, retinal venular calibre, but not arteriolar calibre, was independently associated with the 10 year incidence of a combined outcome, defined as development of gross proteinuria, initiation of renal dialysis or renal transplantation during follow-up . In the same study, these associations were also confirmed among patients with type 1 diabetes . In the Danish Cohort of Pediatric Diabetes 1987 (DCPD1987) with type 1 diabetes, wider venular calibre, narrower arteriolar calibre and lower fractal dimension measured at baseline were associated with the development of nephropathy at the 16 year follow-up [52, 53]. Fewer studies have evaluated the relationship between retinal vascular changes and diabetic neuropathy. In a cross-sectional study of multi-ethnic Asians with diabetes, wider arteriolar calibre was independently associated with peripheral neuropathy as diagnosed by neurothesiometer or monofilament sensory testing . Another population-based cross-sectional study reported that suboptimal arteriolar calibre and larger arteriolar branching coefficient, as well as diabetic retinopathy and focal arteriolar narrowing, were associated with peripheral neuropathy . In contrast, a population-based study among type 1 diabetics did not find retinal arteriolar calibre to be associated with neuropathy . At present, the DCPD1987 study is the only study to provide longitudinal data on the relationship between retinal vascular calibre and peripheral neuropathy in type 1 diabetes. The findings of this study indicated that the 16 year incidence of diabetic peripheral neuropathy was associated with narrower arteriolar calibre, wider venular calibre and lower fractal dimension at baseline [52, 53]. Micro- and macrovascular complications of diabetes share certain pathophysiological mechanisms. First, signs of diabetic retinopathy are independent risk markers for cardiovascular disease (CVD) in diabetes [65, 66, 67]. Quantitative retinal vascular measures such as retinal vascular calibre have also been associated with CVD in the general population in several large epidemiological studies [9, 49]. However, these associations have not been extensively studied in people with diabetes. Table 2 summarises the associations between quantitative retinal vascular measures and macrovascular complications in diabetic cohorts. In the WESDR study, lower AVR, reflecting retinal arteriolar narrowing, was associated with increased risk of heart disease mortality amongst type 1 diabetic individuals over a 20 year interval . Two other prospective cohort studies of type 1 diabetics have reported similar findings. In the New Jersey 725 study, retinal arteriolar narrowing was associated with the incidence of any CVD and lower extremity arterial disease . In the Pittsburgh Epidemiology of Diabetes Complications Study, retinal arteriolar narrowing was associated with the incidence of coronary artery disease in women, but not in men  In another WESDR study report, retinal venular widening was associated with increased risk of stroke mortality in type 2 diabetes . These data consistently support the hypothesis that retinal microvascular abnormalities precede macrovascular events. Nevertheless, the pathways linking the microvascular to macrovascular characteristics require further research. Although retinal vascular fractal dimension is related to microvascular complications in diabetes (discussed above), Grauslund et al found no significant association between retinal vascular fractal dimension and prevalent CVD in a Danish cohort of type 1 diabetes . These data suggest that retinal fractals may have a closer relationship with microvascular complications than with macrovascular complications. Microvascular changes such as impaired reactivity and disturbed blood flow in microvessels have also been hypothesised to contribute to the pathogenesis of diabetes . In contrast to measurement of retinal vascular changes from a single retinal photograph, new retinal imaging technologies can now evaluate retinal microvascular functions in real time. These include flicker-induced vasodilatory response, retinal blood flow and retinal oxygen saturation. Flickering light stimulates neural retina activity and leads to retinal vessel dilation as a result of the release of vasodilating factors, especially nitric oxide, from endothelial and neural cells. It is hypothesised that the response of retinal vessels to flickering light is a measure of endothelial function of the retinal microcirculation . The flicker-induced response can now be measured non-invasively using the Dynamic Vessel Analyzer (IMEDOS, Jena, Germany) in human eyes (Fig. 4). Several studies reported that the flicker light-induced vasodilation is reduced in individuals with diabetes [72, 73, 74, 75, 76] and those with impaired glucose tolerance , and is further impaired with increasing severity of diabetic retinopathy [72, 73]. It has been suggested that endothelial dysfunction may underlie this reduced response in diabetes. Sasongko et al reported that serum apolipoprotein levels may possibly be a better biomarker of diabetic retinopathy compared with traditional lipids, as they were associated with flicker-light retinal arteriolar vasodilation and retinal arteriolar tortuosity in people with diabetes . Impaired flicker light-induced vasodilation has been found to be associated with wider retinal vascular calibre in people with diabetes and in people with or at high risk of coronary artery disease, independent of traditional risk factors [79, 80]. This information may provide further insights into the pathophysiological relationships and mechanisms underlying the relationship of serum apolipoprotein, retinal vascular variables and diabetic vascular complications. It is notable that impaired flicker light-induced vasodilation can also reflect neurodegeneration, as retinal blood flow is coupled with neuronal activity. Thus, reduced flicker light-induced vasodilation may reflect damage to both the retinal neural tissue and microcirculation in diabetes . Alterations in blood flow affect the delivery of oxygen and metabolic substrates necessary for the maintenance of retinal structure and function. Retinal blood flow can be estimated non-invasively by a bidirectional laser Doppler velocimetry system, which measures the absolute values of the red blood cells flowing in the centre line of the main retinal vessels. Laser Doppler flowmetry and laser speckle flowgraphy can also be used to quantify retinal blood flow noninvasively to evaluate the retinal haemodynamics [81, 82]. Alterations in retinal blood flow have been found in both diabetic humans and animal models of diabetes . However, the different studies have reported contrasting findings, which may reflect the complex pathological alterations that occur in the diabetic retina . For example, some studies reported that in individuals with early diabetes and early stage diabetic retinopathy, retinal blood flow was decreased, compared with that in non-diabetic controls. This suggests that decreased blood flow may be associated with endothelial dysfunction and that the decreased blood flow may result in a reduction of nutrient delivery to the retinal tissue that may contribute to the resultant development of microvascular changes [84, 85]. However, Patel et al have found that increased retinal blood flow was associated with early diabetic retinopathy . In a longitudinal study, Konno et al showed an initial decrease in retinal blood flow and then an increase with longer disease duration in prospective diabetic patients . Although alterations in retinal blood flow may appear before any clinical symptoms, none of the above techniques has found its way into clinical practice. The retina is one of the most metabolically active tissues in the human body and as such consumes oxygen more rapidly than other tissues . Retinal oxygen saturation may provide valuable information on retinal metabolism, and it can now be estimated using a technique known as retinal oximetry. Retinal oximetry is based on measurements of the colour of haemoglobin in the retina from the reflection of light at two different wavelengths (586 nm light and 605 nm light) (Fig. 5) [89, 90]. Oxygen saturation is defined as the proportion (percentage) of haemoglobin that is bound to oxygen. Recent studies have observed increased retinal oxygen saturation and a lower arteriovenous oxygen saturation difference as measured by retinal oximeter in diabetic people with diabetic retinopathy [91, 92] compared with normal controls [93, 94]. It has been speculated that increased oxygen saturation in retinal arterioles may be the result of either increased retinal blood flow or reduced oxygen extraction in the eye resulting in a higher oxygen saturation in the retinal venules and a reduced arteriovenous oxygen gradient to drive the countercurrent exchange . Oxygen distribution may be affected by at least three mechanisms: shunting and capillary nonperfusion, thickening of capillary basement membranes, and greater oxygen affinity of haemoglobin in diabetic patients [92, 94]. In addition, retinal oxygen tone is tightly controlled by autoregulation of the vessel diameters . These data, together with impaired flicker light-induced vasodilation in diabetes, lend support to the hypothesis of an impaired regulation of oxygen supply to the diabetic retina . There are various technological challenges in retinal vascular imaging that limit the reliability of measurements. Cataract and other ocular media opacities (e.g. vitreous haemorrhage), pupil size and retinal pigmentation may result in variations of image brightness, focus and contrast of retinal vascular images, which affect the precision of measurements of retinal vascular structure and function. Refractive error (e.g. myopia) and axial length may also affect the magnification and apparent dimensions of retinal structures on fundus photography. Ambient haemodynamic changes during the cardiac cycle may potentially affect the variability of the measurements. Photographic technique, camera type (e.g. mydriatic, non-mydriatic, hand-held) and grader variability may also affect the image quality. These factors should be accounted for when possible. Full automation of measurements is an important goal and further development of retinal vascular imaging technology should aim to minimise artefacts. Retinal vascular imaging offers an opportunity to examine the effects of diabetes on the microcirculation, and may be an additional test in clinical practice. However, to date, the strength of associations between retinal vascular changes and disease prediction has been relatively modest. Moreover, consistency of associations has not been demonstrated, and improvements in predicted risk in diabetic cohorts independent of traditional risk factors are small. Nevertheless, there is great potential for retinal vascular imaging, particularly in the following two clinical scenarios. Estimation of a diabetic patient’s risk of retinal and systemic vascular complication development is crucial as early treatment is associated with better outcomes . While classical CVD risk factors (e.g. elevated serum cholesterol level and blood pressure) are used clinically to assess a person’s risk of CVD, these risk factors do not fully explain the higher risk of CVD events in diabetics [91, 92]. Retinal vascular calibre may be predictive of the risk of diabetic retinopathy and CVD [67, 98]. In the WESDR study, retinal venular widening over time was associated with the subsequent incidence and progression of diabetic retinopathy . Changes in retinal vascular calibre may also represent an individualised indicator of how well diabetes is controlled . Recent studies in the general population have demonstrated that the addition of retinal vascular imaging to existing models of stroke can improve risk stratification [101, 102]. However, the overall improvement is only about 10% beyond that of established risk factors. Further studies are needed to determine whether detection of retinal vascular changes has additional value beyond the methods currently used to stratify the risk of diabetic retinopathy or systemic vascular complications, and to target the test to a more specific subgroup of patients who could benefit from more intensive investigations. This includes work to optimise the risk-prediction algorithm, to determine how it may influence clinical decision-making, and to estimate the cost-effectiveness and acceptability of this type of investigation to patients in different settings. Changes in retinal vasculature may also be markers of the effectiveness of new therapies and reflect treatment response. For example, studies have demonstrated changes in retinal vascular calibre in response to treatment in patients with DMO. DMO results from endothelial cell dysfunction, retinal capillary basement membrane thickening and a reduction in the number of pericytes, leading to increased permeability and incompetence of retinal vasculature. Lundberg et al have reported that following focal/grid laser treatment of DMO, the macular arteriole and venule diameters decreased , and Wickremasinghe et al reported a significant narrowing effect on both retinal arteriolar and venular calibres in patients with DMO in response to intravitreal triamcinolone . Studies have also demonstrated regression of retinal vascular changes in response to blood pressure reduction and that regression differs between different antihypertensive regimens [105, 106, 107]. VEGF increases vascular permeability and instigates vessel leakage leading to DMO, and higher levels of VEGF have been found in the aqueous humour of patients with DMO [58, 108]. Treatment of DMO has improved dramatically during the last few years. Injections of anti-VEGF drugs (e.g. ranibizumab, bevacizumab and aflibercept), sometimes in combination with laser photocoagulation, are currently the mainstay of treatment . However, there remains a lack of vascular biomarkers to indicate retinal microvasculature changes in response to DMO treatment. Retinal venular widening has been associated with a poorer response to intravitreal ranibizumab injections in patients with neovascular age-related macular degeneration . The evidence to date suggests that quantitative measurement of retinal vessels may allow physicians to monitor the progress and success of both local and systemic treatment. There are several areas for future research. First, while data from the above epidemiological and clinical studies suggest that retinal vascular changes are markers of early retinal as well as systemic microvascular damage, the specific underlying pathophysiological mechanisms (e.g. impaired vascular tone, autoregulation, inflammation, endothelial dysfunction) are still unclear. Experimental research and animal models may shed further light onto these. Second, studies to date have primarily focused on retinal photography, a snapshot measurement of retinal vascular changes at baseline, and the associations of these changes with different clinical outcomes . Dynamic functional changes in retinal vessels can now be detected and monitored over time by the use of other retinal imaging technologies. Additional studies are required to further elucidate the clinical relevance of assessing longitudinal changes in retinal vasculature. Third, the current range of software programs for measuring retinal vascular changes is not fully automated nor easy to use without standardised protocols, training and additional input by technicians. New software programs incorporating automated measurement and documentation of retinal vascular changes and risk prediction algorithms are being developed to improve precision and reliability. The next generation of software should reduce existing limitations and improve its implementation in a wider clinical setting. There are many new retinal vascular imaging technologies. For example, adaptive optics retinal imaging [111, 112], en face optical coherence tomography angiography , Doppler optical coherence tomography , scanning laser Doppler flowmetry , spectral-domain optical coherence tomography , and sequential and diameter response analysis , are now being studied to further measure and analyse the detailed structure and functions of the retina (including the foveal capillary network, choroidal vasculature, blood flow, choroidal flow, wall:lumen ratio and retinal vessel responses to flickering light). These developments may offer an improved understanding of how early diabetic complications develop and offer improved risk stratification in clinical practice. The retina is traditionally seen as a site of diabetic damage that results in the classical signs of diabetic retinopathy and subsequent vision loss. The retinal blood vessels, however, provide additional information that allow the study of early structural and functional changes in the microvasculature, possibly prior to the onset of clinically significant microvascular and macrovascular complications of diabetes. Studies using new imaging techniques have provided data and strong evidence that quantitatively measured retinal vascular changes from retinal photographs mirror preclinical changes in the microcirculation associated with diabetes and predict a range of clinical complications. These retinal vascular measures are therefore potential biomarkers of early microvascular damage in pre-diabetes, diabetes and diabetic complications, and may be tools for monitoring interventions. Further development of retinal vascular imaging techniques, with more consistent data on incremental benefit and clinical utility, will allow the translation of retinal vascular imaging as a useful tool to improve the diagnosis, prognostication and management of diabetes in clinical practice. TYW is supported by a National Medical Research Council STaR Investigator Award. All authors were responsible for drafting the article and revising it critically for important intellectual content. All authors approved this version to be published.